You’ve got to see this show! From station to station and down the track, come take an unforgettable musical journey "by rail" across the country jam-packed with the finest entertainment you’ll find anywhere! ​You’ll laugh, you’ll cry, you might even dance...you just never know what could happen when you spend an evening with us! ~ "The Greatest Show On Rails!" 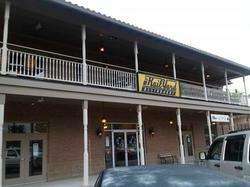 is located upstairs at the Elkins Railyard Restaurant.